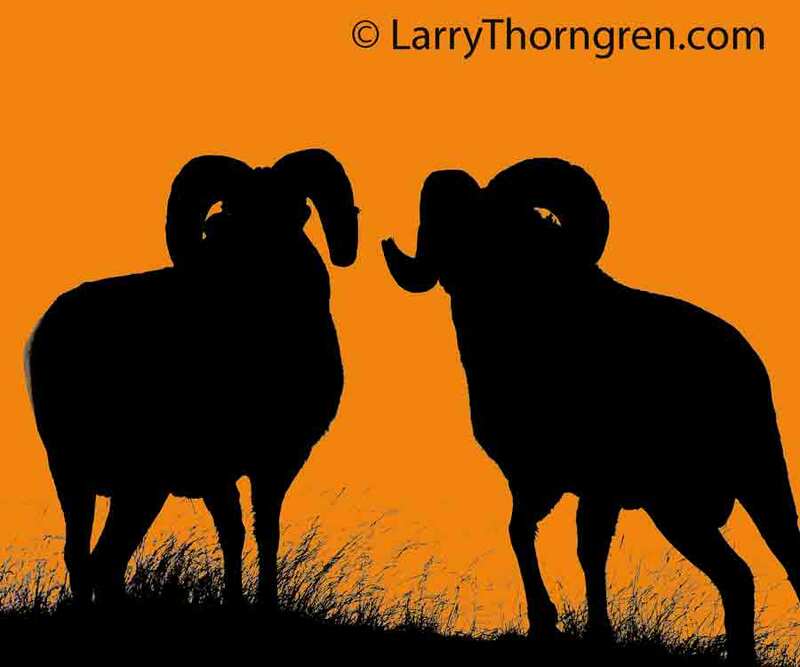 I played around on photoshop elements and came up with this rendition of two big rams silhouetted against a golden sky. Since the rams were facing away from me, the original photo was nothing special. I like to try different effects on some of my photos just to see what they look like. I am self taught in all of my digital processing and need to learn a lot more. may not have been much straight out of the camera but its a stunning image now! I've been following your blog for some time and must applaud you for keeping everyone informed about the radio collar issue. I really like that photo. I tried the same thing with a Pennsylvania elk photograph once and got much the same effect. It turned a lack luster photo into one I really liked, and used for a blog header for a time. I use Canon autofocus cameras and lenses. Other makes of cameras are just as good, but once you start buying large lenses, changing brands is not an option. I use a Canon EOS 60D DSLR , a Canon 5D, and occasionally my older 20D and 40Ds.. I use a Canon 70-300 Zoom and a 100-400 Zoom. I prefer fixed lenses and have a 300mm f4 fixed and the 500 f4 fixed lenses. I often attach a 1.4x Extender for increased magnification. I have a few older lenses like the 100mm macro and wide angles that I use, but they are only available in newer versions. I use a manfrotto tripod and an old manfrotto ballhead. Should Wildlife Research Methods Be Changed? Killing Polar Bears to Save Them? I have always been interested in wild plants and animals. When I was 4, I took my 2 year old brother with me on a field trip along a canal a few blocks from home to look for tadpoles. (The big kids across the street had a tub full of them they had collected there) We forgot to tell our aunt, who was babysitting us, about our plans and when she finally found us along the canal with our collection bottles looking for tadpoles and frog eggs, she wasn’t happy. I got an awful spanking for leading the field trip and taking my 2 year old brother near the canal. When I was 5 my parents bought a farm east of Rigby, Idaho. It wasn’t much of a farm for making a living, but it had about 25 acres of cottonwood trees and an old abandoned homestead with an orchard where I spent a lot of time looking in bird nests and catching garter snakes and frogs. When I was about 8, Carnation Cornflakes started putting an Audubon bird Identification card in every cereal box. I became a collector of bird cards and consumed many bowls of cornflakes in order to get new ones. Before long I had dozens of bird ID cards and by the time I was 10 or 11 knew the names of most of the birds that lived on our farm and along a branch of the Snake River that flowed a short distance from the back of our farm. I looked in every bird nest I could find, and examined hundreds of eggs and baby birds to see what they looked like. When I got old enough to own a .22, I became a hunter of wild things; first rabbits and pheasants, ducks, and then deer and elk when I was older yet. When I went to college, I minored in Biology and eventually taught high school Biology in Idaho Schools and led students on field trips for many years. I started taking photographs of wild flowers and animals to use in sllde-shows for my Biology classes. In 1980 I won National Wildlife Magazines’ photo contest and began to sell my photos at arts and craft show in Idaho and surrounding states. Since then, I have sold many thousands of matted and framed photographs that hang on walls all over the U.S and several foreign countries. Today, I still sell at some shows each summer and have managed to get published in several magazines and calendars. I enjoy observing and photographing wild animals. I would have a hard time living in a world without them. When I travel on my quest for better wildlife photos, I am appalled at the number of abused and radio-collared birds and mammals that I see in our National Parks and Wildlife Refuges. It seems that every wildlife researcher wants to sit in his/her office and watch the satellite signals come in from these ugly, intrusive devices used to track these unfortunate animals. I would like to see these collars banned from our National Parks. Let the researchers use remote cameras if they need to study there.